In 2013, a sudden burst of x-rays from near the massive black hole at the center of the Milky Way caught astronomers attention. 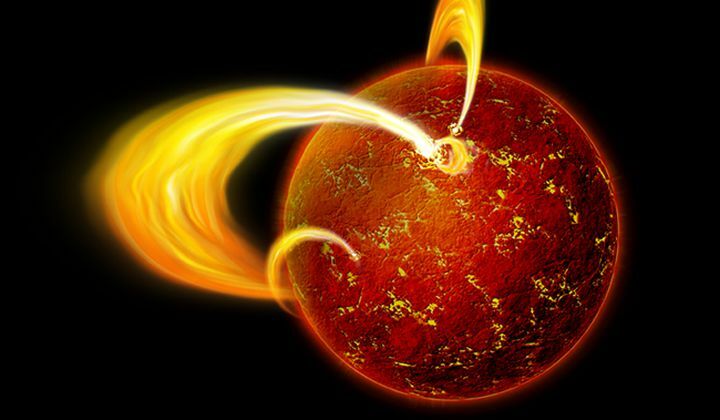 The source was a magnetar, a neutron star with a hugely powerful magnetic field, located a mere 0.3 light years from the black hole. Monitoring by NASA’s Chandra X-Ray Observatory and ESA’s XMM-Newton shows that x-ray bursts are still being emitted from the dense, collapsed star and the number is dropping at a slower rate than those from other magnetars. Astronomers first thought “starquakes” might be the reason, but now they believe that the neutron star’s surface is being bombarded by charged particles trapped in twisted bundles of magnetic fields—bundles that were made when the neutron star formed—that keep the surface more heated, and the x-ray outbursts more frequent than they would be otherwise.